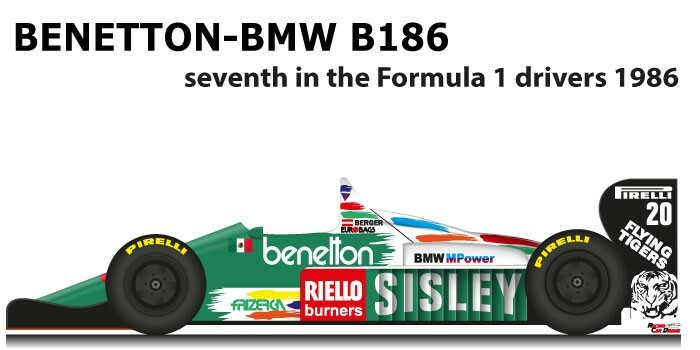 The Benetton – BMW B186 n.20 is a car that took part in the 1986 Formula One World Championship. The Benetton family bought Toleman at the end of 1985. He continued to entrust the design of the new car to the engineer Rory Byrne which was based on the characteristics of the Toleman TG185 but combined with the BMW turbo engine and the Pirelli tires. Gerhard Berger with Benetton – BMW B186 n.20 arrived seventh in the Formula 1 World Championship in 1986. The Austrian driver proved himself to be always very competitive, obtaining two pole positions in the season. Unfortunately, in the race the lack of reliability of the BMW turbo engine forced Berger and team-mate Teo Fabi to retire. Using the Pirelli tires, Berger won the Grand Prix of Mexico without changing tires, leaving Prost with the 25-second Mclaren MP4/2C and Senna with the 50-second Lotus 98T.